Girona is the main town about a fifteen-minute drive from the Castel d’Escales and well worth a full day visit. The town is a bit off the beaten tourist track which is both good and bad. It’s good that the twisting, atmospheric medieval streets and interesting museums are not crowded. On the other hand, it’s unfortunate more people don’t take the time to stop and linger for a few hours to enjoy Girona’s charms. Jane from South Africa, her son, and I walked from the train station through new Girona to the river and from there into the old city. The colorful, multi-story houses of old Girona overlook the very laid back River Onyar. Behind the houses twist a delightful tangle of narrow streets and steep steps and secret passageways. Even on a hot day (and it was a hot day), the stone lanes are lovely and cool. A disappointing lunch in an atmospheric location set us up for an afternoon of easy sightseeing. We should have known better than to frequent a café with plasticated three-course 11-Euro menus in six languages. On the up side, my patates brava – roast potatoes smothered in garlic mayonnaise—were gratifyingly hot and crispy. After lunch we walked a few steps to the Jewish Museum. 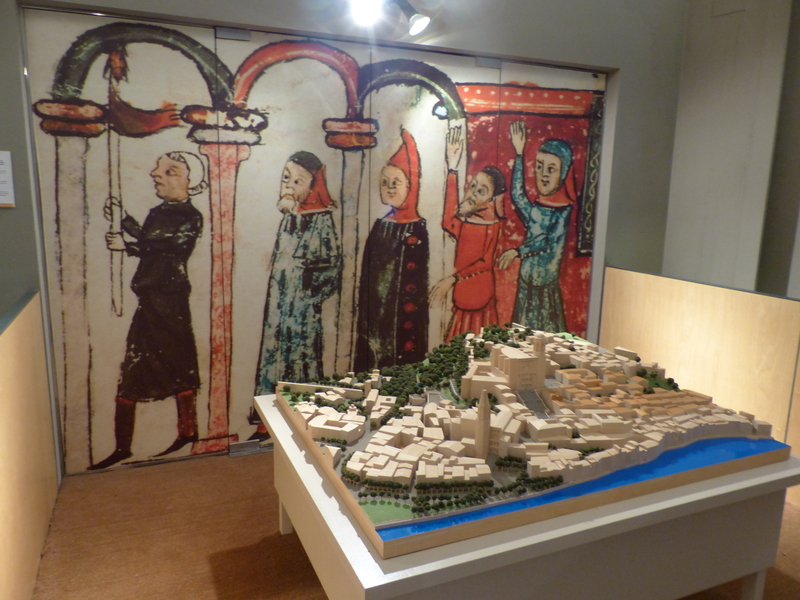 Occupying two floors of an ancient building in old Girona, the Jewish Museum provides a thoughtful and well-curated display that traces the history of the Jews who lived in Girona from the tenth century to the expulsion of the Jews in 1492. At the start of the exhibit is a short slide show that relates the story of the Jews in Girona in four languages—Catalan first followed by Castillion (Spanish), then English, and finally French. I was fascinated to see the differences between Catalan and Spanish. Some of the words were the same but a surprisingly number were not. I’ve heard that Catalan bears more resemblance to Portuguese then to Castillion. Interactive screens in the various rooms show maps of the Jewish quarter and key locations. One map traced the growth of the population over the 500 years—the quarter growing and shrinking depending on the level of tolerance from the surrounding Christians. Prior to 1492, Jews, Christians, and Moors had lived in relative peace. I found it interesting that very few people actually left the Jewish quarter in 1492. The majority chose to convert to Christianity–or at least pretend to–rather than leave. I shouldn’t imagine any of the available choices were very palatable.The museum encloses a peaceful courtyard and a very large star of David incised into the pavement. Original stone archways and dark passageways complete the museum. From the museum, we wandered through the shady cobbled streets to a flight of steps that led up through a covered passageway to the cathedral. Its main door is one of the widest I’ve ever seen. 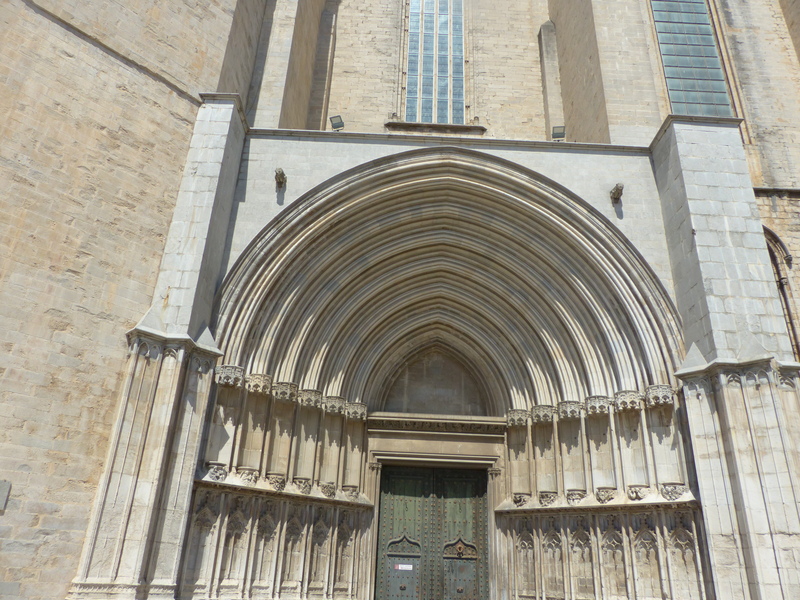 Once inside, we discovered via audio guide that the nave of Girona Cathedral is the widest Gothic nave in the world. Only St. Peter’s in Rome has a wider nave; however St. Peter’s is not a Gothic cathedral so it doesn’t count. The cathedral was really quite lovely as cathedrals go. A great many stained glass windows—some round, some tall and thin, some with modern designs pierced grey walls. Unlike some Spanish cathedrals I’ve been in, the Girona Cathedral was not overly endowed with gold. It had a much more northern feel to it—almost like a cathedral in northern France or even England rather than Spain where more ostentatious ornamentation is usually the norm. Outside the cathedral was a lovely cloistered square with stone carvings of various Bible stories adorning the tops of the pillars. There is something immediately soothing about a cloister. It takes very little imagination to see the ghosts of nuns and monks gliding by. After exiting the cathedral, we noticed what looked like a medieval street scene cordoned off behind a pre-fab fence manned by a security guard. 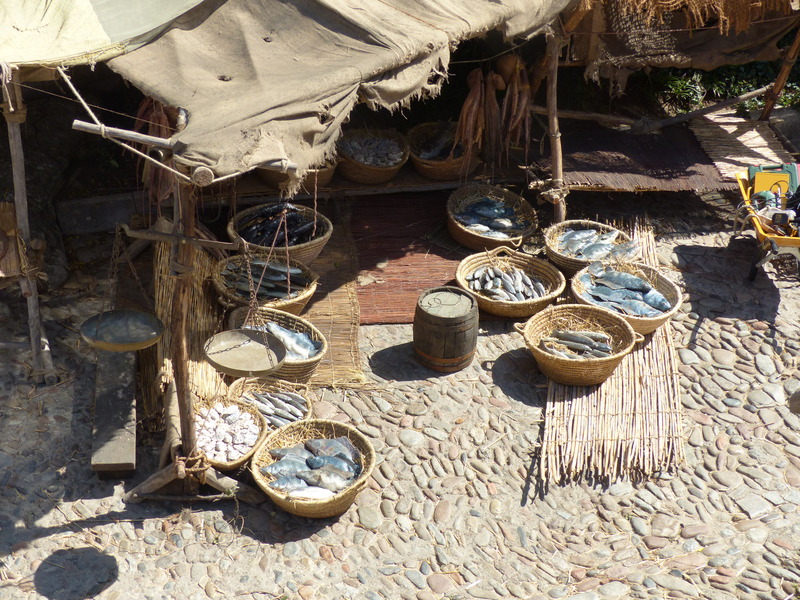 We thought it might be a movie set and sure enough, the guard informed us that the street was to be used in an episode of The Game of Thrones to be shot in early September. My inner fan girl kicked in on behalf of my daughter who is a dedicated fan. I personally don’t like the show (too violent), but I can appreciate the costumes and the stunning production values when people are not being speared, tortured, boiled in gold, or otherwise mangled. The few times I’ve watched the show, I’ve had my finger on the fast forward just in case. Anyway, my personal opinion of Game of Thrones does not preclude enjoying the opportunity to get a good look at the set. We were directed to the Arab Baths which included a terrace from which the entire set was visible. 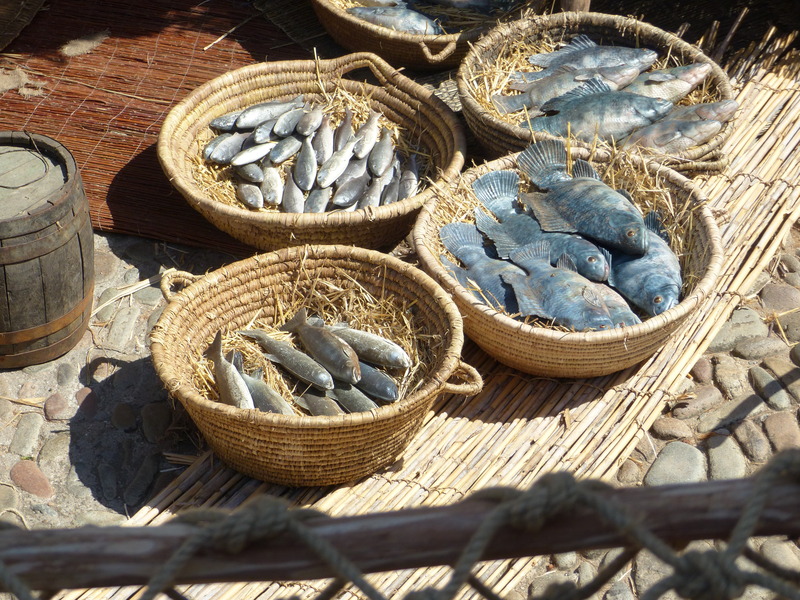 I was particularly taken by the giant baskets full of fake fish. 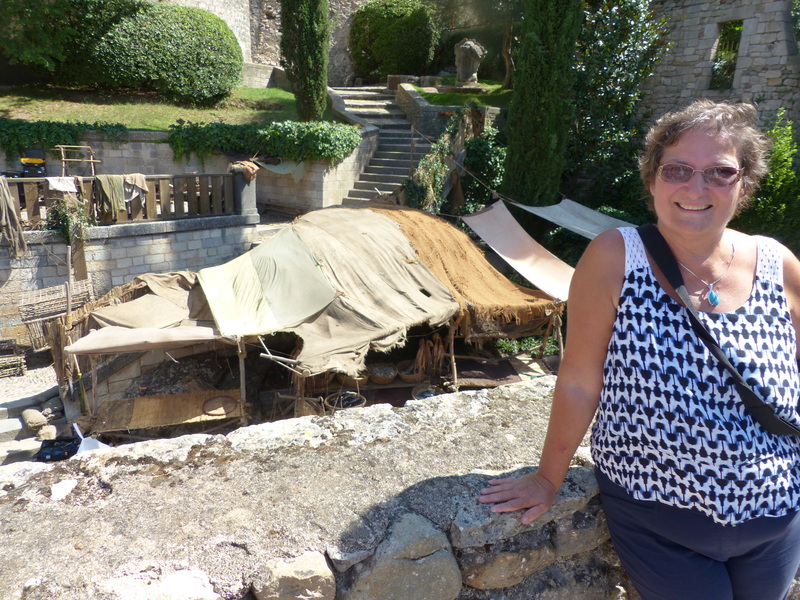 We think the set may be for King’s Landing but I guess we’ll need to wait until Season 6 to know for sure. Many photos later, we wandered down to the river’s edge for an ice cream and then a scenic stroll back toward the new town. 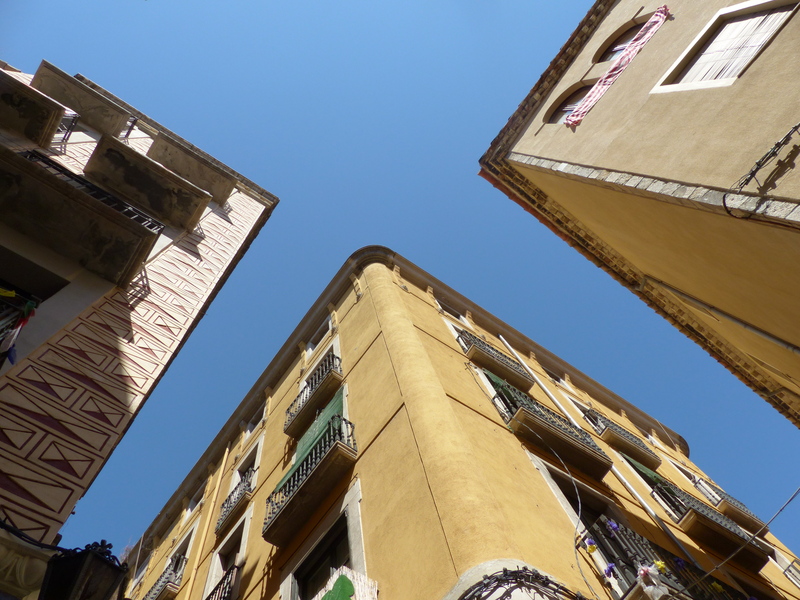 The facades of Girona’s river facing houses are famous for good reason. 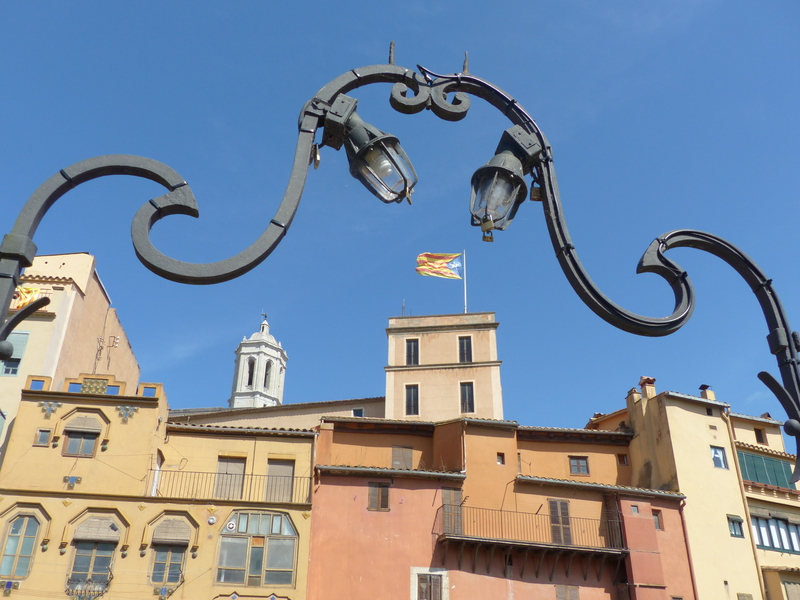 I was particularly taken with the number of Catalan flags festooning the many balconies. We arrived back at the castle for a plunge in the pool followed by a glass of cold white wine and another dinner—alas, my last. My stay at the Castel d’Escales has been a wonderful and relaxing introduction to what is about to become a crazy European sojourn. 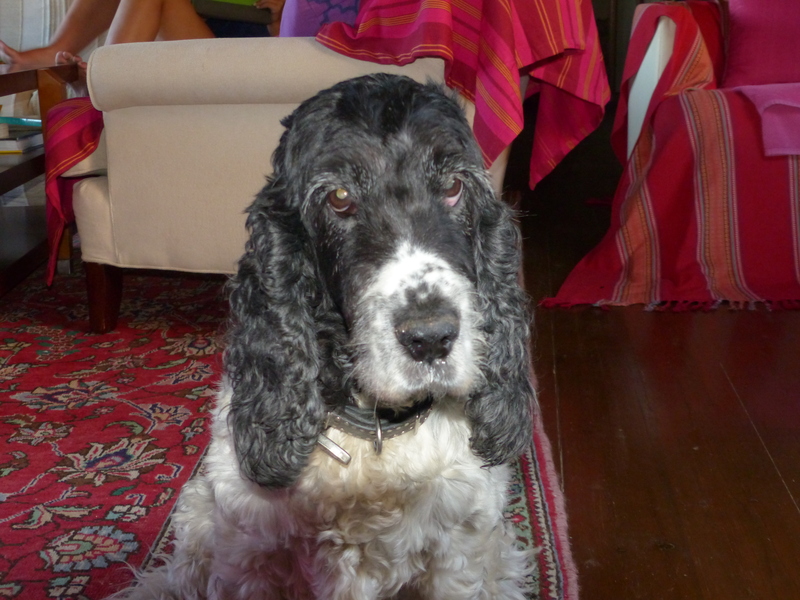 I’ll close out my Castle musings with a special mention of Bessie the castle dog. She is getting on in years (about twelve I believe) and not terribly spry but with the sweetest disposition I’ve seen in a dog in a long time. Apparently, she almost always takes a shine to one guest each week and follows them everywhere. I was rather chuffed to be the chosen one for my week. Bessie sometimes waited for me outside my door and very often followed me up and down the stone steps leading from the ground floor up to the bedrooms. I think I may have been chosen simply because on my first day at the castle I got up very early (jet lagged) and so was the first person she greeted when I came out to the terrace. Or maybe she just really liked how I smelled. Regardless, I was sorry to say goodbye to Bessie—and my gracious host of course.